Considering a building project for the first time and unsure where to start? Then contact AGD Architectural. We specialise in residential design, so whether your project is a typical extension or a larger, new dwelling, AGD will always be happy to provide a free, no obligation site visit. We will assess the feasibility of your proposal and guide you through the entire process from initial ideas, planning submissions and building control applications to the completion of your building project. AGD Architectural Ltd is a small architectural practice based in Chester, which provides a comprehensive range of high quality and professional architectural services and specialises in the residential sector. 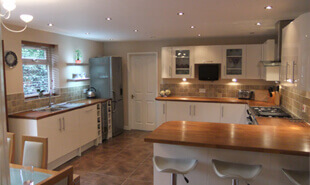 With over 10 years experience of architectural design and planning, we have been involved in designing many hundreds of projects, ranging from kitchen extensions to new-build housing estates. We are happy to provide references and testimonials from previous/existing clients.